When you want to get organized, why not call on the expert? The Garage Guy has worked with hundreds of satisfied customers to solve their garage organization challenges. With innovative storage solutions, top quality cabinetry, and professional installation, there’s no need to look any further. The last thing you’ll want with your garage remodel is additional cleaning, or ineffective cabinets. Some cabinet companies offer garage cabinets that don’t reach all the way to the floor. This is a cookie-cutter approach that has no direct benefit to the consumer. Just imagine what will collect under those cabinets. Sure, they’re easier to install, but they will ultimately create more work for you, the customer, in the long run. 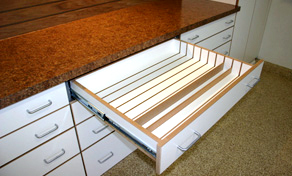 With hundreds of garage remodeling projects under our belt, The Garage Guy knows exactly what you need in a cabinet. Garage cabinets by The Garage Guy are custom cabinets which start from the floor up, using a unique sealed base system. By building cabinets from the floor up, load capacity is dramatically increased. 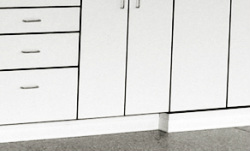 Cabinets which are only wall-mounted or wall-mounted with legs, simply don’t do the job. The weight capacity of our cabinets can be measured in the thousands of pounds. After all, it’s a garage. You should have the ability to store some pretty heavy stuff. 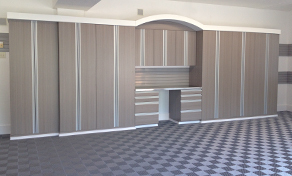 Be assured, our cabinets are built to be the best. Load support, capacity and custom quality cabinets is your ideal solution. The Garage Guy provides complete storage systems which function just the way you need! Contact us to learn more about functional storage systems designed specifically to meet your unique needs.